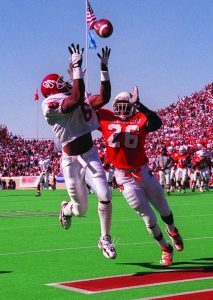 Michael McDaniel, 6, makes a touchdown reception for the Sooners during the 1996 Oklahoma-Oklahoma State game. A wide receiver for the Sooners, McDaniel played three seasons, 1993-96. He played for three different head coaches—Gary Gibbs, Howard Schnellenberger and John Blake. He said the Bible teaches that Christians live detached lives, being not of this world, and the transitions experienced in life help teach that the Christian life is transient not permanent, as far as things of this present world. McDaniel recently completed his 10th year as pastor of Forest Park, Northeast Missionary, located east of I-35 in the Oklahoma City metro. He said he answered God’s call to ministry when he was a freshman at OU. Though he worked as an athletics director a few years after he graduated from college, he first became a pastor of Muskogee, First Missionary in 2002. Then he was called to Forest Park in 2008. He believes sports helped prepare him for his current life and his time in ministry. McDaniel has been pastor of Forest Park, Northeast Missionary for more than 10 years. He thinks highly of the many coaches he had at OU. He also appreciates the guidance of his academic advisors, including Theresa Turner, Thomas Hill and Gerald Gurney. McDaniel also reflects fondly of the games he played. One game in particular was the 1996 Bedlam game, when OU faced Oklahoma State in Stillwater. Late in the second quarter, Eric Moore found McDaniel deep in the end zone, and the touchdown gave the Sooners a 14-7 halftime lead. “That was my version of ‘The Catch,’” he said with a laugh. OU won the game, 27-17. McDaniel acknowledges there is another transition happening among Southern Baptists and National Baptists. His church is dually aligned with the Baptist General Convention of Oklahoma (BGCO) and the Oklahoma Baptist State Convention (OBSC), and McDaniel credits charter members of Northeast Missionary, including Chairman of Trustees Tom Morrison, for being forward thinking and deciding to make the church dual members of both state conventions. McDaniel appreciates the concerted effort toward racial reconciliation being made among Southern Baptists and National Baptists. McDaniel also appreciates the work being done under the leadership of Hance Dilbeck, BGCO executive director-treasurer, and Anthony Scott, OBSC president. 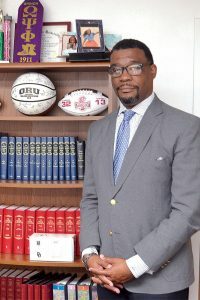 He believes the work done with the Langston University Baptist Collegiate Ministry, involving both conventions, is a demonstration of community. Using the example of football, McDaniel explained how Southern Baptists and National Baptists can work together. “Here’s the thing that sports teaches us,” he said. “It brings all kinds of people into one locker room. It brings the suburban. It brings the rural. It brings the rich. It brings the poor. It brings the highly educated. It brings the less educated. It brings everything you can imagine to the locker room. From the gridiron to the pulpit, McDaniel has made many transitions in life. He knows God is working, as Baptists and other believers are working toward racial unity.